Well, today has been very eventful and quite an historical occasion both for us and America. The new Verrazzano Narrows Bridge was opened and what a splash they made of it too. We got up at 10am and it was a beautiful day, clear and bitingly cold. We got on a tube and charged off down to Brooklyn to a station near the new bridge. There were thousands of people there all waving the Stars and Stripes, and there was a great feeling of excitement in the air. The bridge is fantastic. It’s the longest suspension bridge in the world, and I should imagine the most graceful. The actual road has a gentle curve and it looks so slim and fragile you wouldn’t think it could carry traffic. All the usual ballyhoo was taking place, motorcades, brass bands, processions, etc and masses of officials at the opening ceremony from all sorts of countries, although for some reason Britain wasn’t represented. The bridge was officially opened on the Brooklyn side at about 12 noon, and the motorcade then drove across it to the Staten Island side and another ceremony took place, and the bridge was officially declared open. The air was filled with helicopters and sea planes, and the water below the bridge was jam packed with boats all covered in bunting. Then at about 12:45 a fleet of warships sailed under the bridge and all hooting like mad on their sirens, which was taken up by the smaller boats as well, and also by the motorists parked all around. Then the ship the ‘United States’ sailed into the harbour very slowly under the bridge, and let off her siren which boomed across the water. At this point the tugs and fire boats all around set off their water fountains in the traditional New York welcome. It was a glorious sight. The world’s longest liner under the world’s longest bridge – all-American of course, and I got some good shots with my camera. The motorcade then came back across to our side to have a slap-up buffet lunch in a marquee under the flyover which led onto the bridge. All the big wigs were there Kennedy, Keating, Rockefeller, Wagner and all the designers and engineers of course plus all the foreign ambassadors. The approach to the bridge at each side is fantastic – flyovers flying over flyovers, forming the most fantastic patterns. It was very cold by this time so we went and had some lunch, and then decided to be amongst the very first to cross the bridge. The bridge was opened to the public traffic at 3 o’clock. As there are no pedestrian pavements and the only way to cross is by vehicle, we joined a queue about a mile long to get on a bus. The first bus arrived at 2.45 and absolute pandemonium broke out to get on the first bus. This was a new service especially started to cross the bridge. Finally, order was restored and we all settled down to a long wait. It was bitterly cold by this time but we got chatting to some people in the queue behind us and the hour that we had to wait soon passed, and we finally got on a bus (about the 10th I should think) and we were off. As you can imagine thousands of motorists from all over had the same idea, and the jams were terrific. There was a great spirit on the bus, lots of joking and laughing and everyone hanging out of the windows with cameras in spite of the cold. I got some good pictures I hope from the bus. The view from the middle of the bridge was wonderful. Once again it was just sunset and the island of Manhattan in the distance looked great. We always seem to see this view at sunset which I’m sure is the best time to see it. Having seen a bit of history being made, and having made a bit by being one of the first to cross the bridge, we went down the coast to the Staten Island Ferry Terminal and took the ferry back to Manhattan, this time seeing the bridge lit up in the distance. It was bitingly cold on the open deck but well worth it as the air seemed crystal clear, and every light on Manhattan seemed so bright. By this time the temperature was well below freezing and boy did we feel it!! Only a couple of days before it had been up in the 70’s. We went to the girls place and had a farewell evening there watching television and nattering, and we then went home to pack and get ready to move. On the way home we saw a policeman skipping down the road shouting and singing, we thought he was drunk at first (or mad) but when he came across to walk with us, he explained that he was happy to be going off duty in a few minutes, hence his high spirits. After whistling after a couple of women he went into a coffee bar. The police here seem to smoke and go into to coffee bars whenever they like. Well, Herbie and Vi arrived at 9:45 and we were soon loaded up and ready to go. They had Vi’s car this time, which is fabulous. 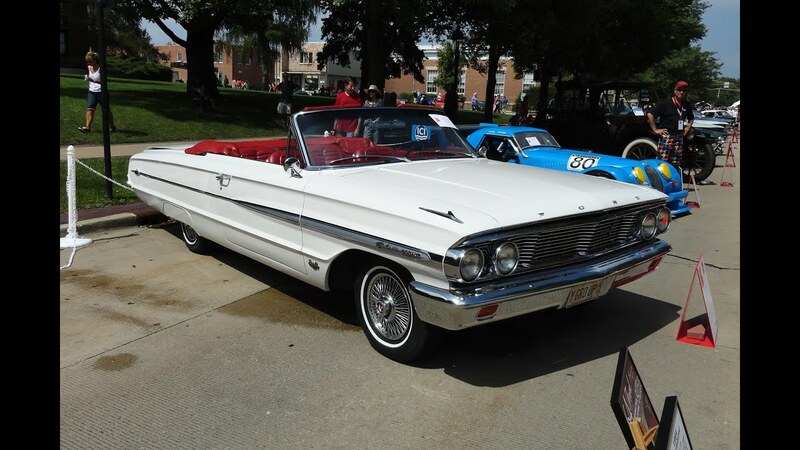 A white Ford Galaxie with vivid red leather upholstery. We said goodbye to Mr Riviera who wasn’t at all sorry to see us go, and soon we were heading out of New York. One month in that mad place is enough for anyone, and as one man said: ‘New York is an education you don’t need’. Herbie informed us he had found us a place to live and had paid a week’s rent in advance, which we thought was terrific (especially considering he has been in bed with pneumonia for two weeks since we last saw him). The drive down was great. Another crystal-clear day with the temperature well below freezing. We found this hard to believe as it didn’t seem that cold. It is definitely a different type of cold here. I am beginning to appreciate all this central heating since the change in the weather. We drove down on the New Jersey Turnpike which is a super highway, and I drove halfway, and Colin the other half. All our luggage was in the boot which will give you some idea of the size of the car. On the way down we talked about Herb’s forthcoming trip to Florida, and he has persuaded us to go with him for the two weeks. That’s a laugh as if we would need much persuasion!! Vi is coming too, so it should be great. After one day he said, ‘it will be hood down and sunshine all the way’. We will drive continually all the way, taking it in turns to sleep in the back. We are going down one way, to see an Indian Reservation where thousands of Indians live in their natural state (the only difference being that instead of horses they have cars) and then back by another route through the Everglades to see man-eating crocodiles. The temperature down there (Florida) yesterday was 88 degrees, so it should be great. We are taking our tent and we’ll camp to save money. If we can fix up jobs we will go straight back down after we have returned to pick up our things in Philadelphia. Anyway – to continue our journey down. We turned off the turnpike and stopped for a coffee and then drove on through a forest towards what Herb said was ‘a nice place’. This was Lake Pine. This was a lake area in the middle of the forest and had beautiful bungalows built on the water’s edge, and in clearings in the woods, all built out of the actual trees but all in very modern style. Like modern log cabins, with their canoes and motor boats outside the doors, and all this only about 20 miles from Philadelphia. On the way up Vi and Herb saw a man driving along with a bear on the roof of his car having just shot it, and taking it home to eat. Apparently they eat bear steak. We soon reached Philadelphia which seems at first impression quite a nice place although in places very industrial. It has a population of about 5 to 6 million, so as you can see, it is quite a big place. We went to see her Herb’s landlady and family. She’s about 40 and a scream!! The first really friendly American we have met. She even fixed me up with the name and address and telephone number of a nurse so that I ‘wouldn’t be lonely’. We left there after about half an hour and went to our new home. It’s a beautiful house overlooking a park. A really typical American house – all wood and very cozy. We have two rooms, fridge etc etc all for $15 a week. the landlady is terrific and very friendly. She is Dutch and so is her husband. We then left there and went to Vi’s place (her Diner) I mean. It’s a lovely place, like a small snack bar and cafe. Beautiful and clean and really impressive. She works terribly hard and is there at 6 am every morning. The customers love her and she twists with the kids to the jukebox music. We made some coffee and raided the ice cream and fruit containers and had a snack. Colin was very interested in all the equipment, and he and Vi had a natter about catering. She is terrific fun and we like her a lot. She flirts like mad with Herbie, and you would think they were 16 not 60. We then went up to her house. She owns a lot of land around the house, and has a lovely house all furnished in early American period furniture. The whole place is very tastefully decorated and the whole atmosphere is one of warmth and comfort and ‘quiet luxury,’ if you can imagine what I mean. Of course the swimming pool does spoil the quiet luxury bit, but funnily enough it fits in very well. It’s pity we can’t use it, as it is so cold. We met Jan and her husband Eddie, and their son Eddie Jr. And also Tony, James and Pat. They live above Vi and Jan lives below. Jan is very much like Carolyn, and even Colin remarked on this. We didn’t go up to Verna’s place <Vi’s daughter> as her husband was out and she (and Vi) wanted us to meet both her and her husband together, so we will go up one night this week. We stayed watching TV and eating until about 7 o’clock and left with Herb. Tony and his wife came over on the Queen Elizabeth so we had lots to chat about. He has a good job and likes America very much, and he has bought a very nice car already, although as yet he doesn’t seem to have been anywhere. He seems work and money mad, and is even thinking of getting another part time job at Christmas. He earns about £50 a week which isn’t bad. The temperature was unbelievable by this time – minus 15 degrees Fahrenheit. I’ve never been in such cold weather in my life before. We then went on a tour of Herb’s friends and met lots of really friendly people in their homes. Herb seems proud to have us with him, and took us into loads of coffee bars and garages and proudly said, ‘these are my friends from England.’ He has obviously been talking about us for weeks, as they were all expecting us. The difference between people here and in New York is amazing, as it is only 90 miles away. Collingswood is a real ‘one horse town’ and is about 10 miles from Philadelphia. It has one main street and that’s it!! At first we found the silence rather eerie, but now have got used to it. We finally got home and unpacked and fell exhausted into bed.